With their crispy exterior and soft, pillowy insides, it’s pretty much impossible not to love tater tots—except if you’re watching your carb intake. But the good news is, just about any vegetable can be made into tots. Although the texture isn’t quite the same as the potato version, they often pack in much more flavor and nutrition, with fewer carbs. 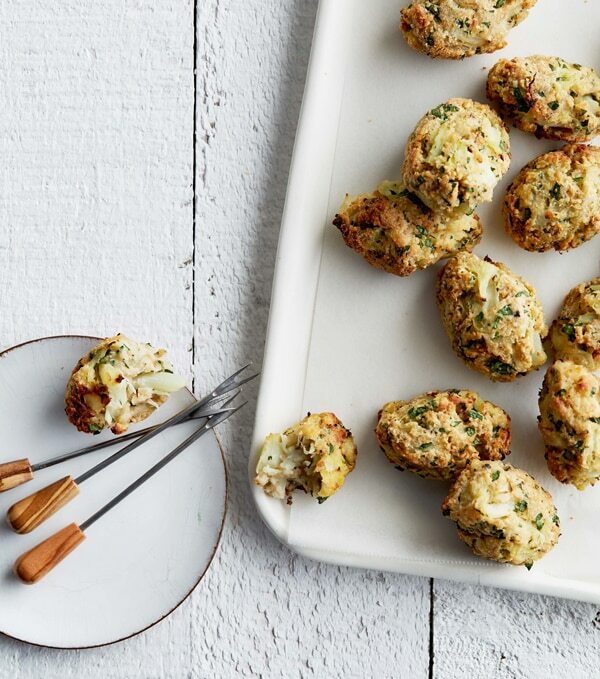 These Cauliflower Tots are the perfect example. Cauliflower takes on an almost nutty flavor when baked in the oven; cheese and breadcrumbs are used to help bind these tots, which adds even more flavor. Pair them with a sauce for dipping for the perfect healthy snack, or serve them as a side with sandwiches or veggie burgers. This recipe is shared from Danny Seo’s new cookbook Naturally, Delicious. Although this book isn’t 100% vegetarian, it does contain enough meat-free recipes and tips that it’s worth checking out, particularly if you’re interested in healthy, organic meals that aren’t time-consuming to make. Some of our favorite vegetarian recipes from the book include Kale, Red Onion and Goat Cheese Strata, Sweet Quinoa Waffles with Yogurt, Coconut Bacon and Fruit Compote, Indian-Inspired Kamut Stew, Plantain Tortilla with Roasted Vegetables, and Vegan Chocolate Chip Cookie Cake. Preheat the oven to 400°F. Line a baking sheet with parchment paper and brush with olive oil. Microwave the cauliflower according to the package directions, and cool to room temperature. Place the cauliflower on a clean dish towel or piece of cheesecloth, and roll it up and wring it out to extract as much moisture from the cauli¬flower as you can. Transfer the cauliflower to a large bowl and break apart the florets with your hands. Add the bread crumbs, cheese, egg, parsley, garlic powder, and pepper. Using your hands, mix until the mixture holds together. Using a tablespoon measure, scoop the cauliflower onto the prepared baking sheet. Use your hands to roll each scoop into an oval-shaped tot. Bake for 15 minutes, remove from the oven, turn the tots over, and bake for another 15 minutes to crisp the other side. Serve warm. I wish you had a print option.